It's a no-brainer that Neon Carnival is THE party to attend during weekend 1 at Coachella. The highly anticipated desert experience, that continues to partner the biggest names in entertainment with consumer lifestyle, returned to illuminate the night sky with its biggest fête to date in celebration of its 10-year anniversary. In partnership with Levi’s® Brand, the exclusive event welcomed new additions including Australian born beauty brand Bondi Sands and the upcoming big-screen adventure “POKÉMON Detective Pikachu,” from Warner Bros. Pictures and Legendary Pictures, to commemorate another year of music and festivities. Conceived by LA’s original nightlife maven, Brent Bolthouse, the unrivaled outdoor dance party recognized as one of the world’s most coveted after-parties, attracted the industries entertainment elite. Celebs such as: Leonardo DiCaprio, H.E.R., Alessandra Ambrosio, Janelle Monae, Odell Beckham Jr., 2 Chainz, Quavo, Wiz Khalifa, Meek Mill, Young Thug, Nav, Niall Horan, Liam Payne, Marshmello, Paris Hilton, Winston Duke, Cuba Gooding Jr., Zedd, Romee Strijd, Shanina Shaik, Quincy, Christian Combs, Justin Combs, Ashlee Simpson Ross, Evan Ross, Karrueche Tran, and more were in attendance. Ashlee Simpson-Ross was snugged up to hubby Evan Ross. They stylish couple has been doing their festival party hopping all weekend and looking super fashionable the entire time. Famed stylist Rachel Zoe and husband Rodger Berman enjoyed a night out (and a day off!) Rachel Zoe held her annual Zoeasis the previous night at The Parker Palm Springs. The 5th Annual ZOEasis event, a Saint-Tropez-inspired soiree under the desert sky inspired by Rachel’s latest collection. Infused with Rachel Zoe’s iconic aesthetic and unparalleled taste, ZOEasis is the fashion event of Coachella! Fresh off her highly-anticipated set at the desert music festival, Janelle Monae arrived in party mode with her gal pals to Neon Carnival. Festival-goers are still coming down from her exhilarating performance on day one of the festival. After Monàe asked, “Do you got the juice?” referring to Lizzo’s single “Juice,” the two starting twerking together. The “Pynk” songstress was seen lounging in the HEIMAT VIP lounge sipping on Penta Water before making her way through the packed party to catch A-Trak’s first performance at this year’s event. Paris Hilton has remained faithful to this event and, in true fashion, took the party by storm. Her and Alessandra Ambrosio shared dance moves while snapping selfies while joining the stage for their own dance party while DJ Ruckus spun his favorite tracks. Festival attire is a real thing and the parties at Coachella are sheer proof. Rapper 2 Chainz arrived in style donning in a green sequin Gucci ensemble with matching shorts and tee. The perfect amount of extra to get the attention of fellow musicians Quavo, Meek Mill, and Young Thug. Attendees are able to release their inner-child at the adult carnival while dancing the night away, playing games, riding classic carnival rides while sipping beverages from Don Julio and Golden Road brewery. 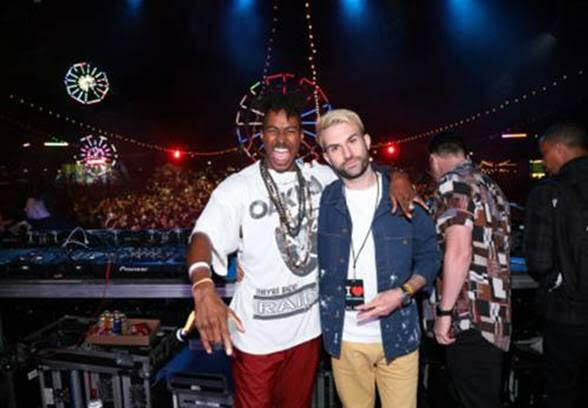 No strangers to the nightlife scene, Hollywood heavy hitter DJs Kayper, DJ Ruckus and a special guest performance by world renowned DJ, producer and Fool’s Gold record founder, A-Trak kept partygoers dancing with performances that last into the early morning hours. Being the 10th year anniversary since its inception, Neon Carnival had to pull all the stops! Taking place at HITS Desert Park, the newly redesigned all grass layout spans 3 football fields, and featured new carnival style games and exhilarating amusement park thrills. The over-the-top event of the year showcased an even bigger and better event than before.